A photo of the Sony Xperia Z4 has surfaced today in an email allegedly sent by the head of Sony Entertainment. According to previous rumors, the official presentation of the device could come as early as next month on January 5. During the past month or so, the Sony Xperia Z4 has reared its head online on quite a few occasions. Back in late November, the device was spotted in a few blurry photos, and only last week the Xperia Z4 got another set of rumored specs. Building up on that news, today a much clearer look at the upcoming handset has made its way online, as a photo of the smartphone was leaked in an email allegedly sent by the Sony Pictures Entertainment CEO. 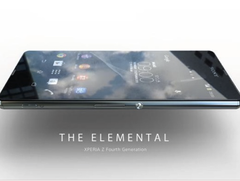 If this recent leak turns out to be accurate, the Xperia Z4 will come with a design not very different to that of its predecessors. All of the trademark design features of the Sony Xperia Z smartphone series can be spotted in the leaked photo of the Z4, including here the metal frame on the sides, a pair of stereo speakers, and a large metallic standby button on the right side. Apparently, Sony is not ready to ditch the Omnibalance design philosophy which stood at the core of the three previous Xperia Z smartphones. At the visual level, the leaked photo shows a handset that's very similar to the Xperia Z3, but with slightly more rounded corners and smaller bezels surrounding the display. According to previous rumors, the Sony Xperia Z4 will feature a Qualcomm Snapdragon 810 chipset, a 5.2 or 5.4-inch display running either a fullHD or a QHD resolution (rumors back up both versions), 4GB of RAM, and an updated 20.7MP main camera. Sony is expected to unveil the Xperia Z4 on January 5 at a press event scheduled the day before CES 2015 kicks off in Las Vegas.